Printing barcodes from SAP R3 (Linux, AIX, Unix...) to PCL and Postscript printers - without barcode fonts or barcode printers. Printing barcodes from SAP R/3 - completely printer independent - without barcode fonts or barcode printers. All bar codes generated by our Print Engine on Linux for Postscript- or HP- printers (PCL / HPGL). Print all barcodes on PCL and Postscript printers - in best possible quality! Test it - free download of our barcode software for Linux available! The latest release of our barcode engine for Linux is available from our web site via free download - click here for the free unrestricted eval version . For your eval process we offer you free product support - please contact our support team. Use the link above to go to our free download section. 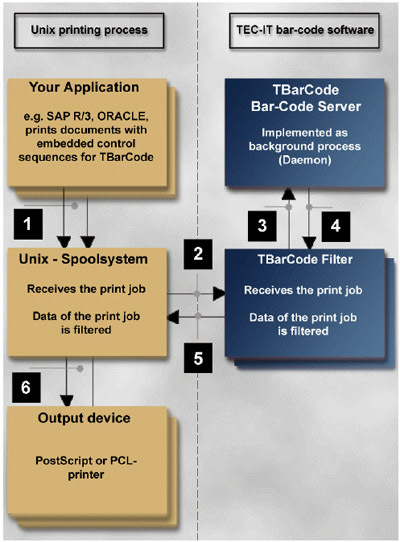 With this software you can build up a bar code server for SAP R/3. You can print all bar codes in highest resolution on all PCL or Postscript printers. The bar code engine generates the barcode by software (vector-based) in the highest possible printing quality. No inflexible barcode fonts or additional bar code cartridges needed. No special barcode printers. No expensive upgrades or printer hardware changing. Barcoding made really easy - for Oracle, SAP R/3 and other ERP systems, where you can integrate a Linux server! Using our software you change your printer without the need of upgrading fonts, barcode dimms/simms or anything. Change your hardware without considering bar code functionality, because the bar code generation is built in to our software and our software prints bar codes completely printer independent!